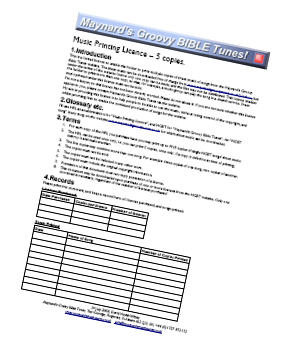 A licence to permit you print 5 (FIVE) single-song copies of sheet music from Maynard's Groovy Bible Tunes songs. Would you like to print more than ONE copy of the sheet music? This licence permits you to print 5 (FIVE) single-song copies of sheet music from Maynard's Groovy Bible Tunes songs. It could be 5 of the same song, or 1 each of 5 different songs, or any combination that adds up to 5 (e.g. 3 of one, 2 of another). Remember - you can download the sheet music for any song FREE from the Jukebox - but not for distribution, and only for one print copy. If you want to print more copies you need this licence, or a CCLI licence. Church Music Group - you want to sing a song in the Sunday service, but need ten copies of the sheet music. Buy two of these licences, and you can print the sheet music out. Holiday Club Leaders - you want to sing three songs in your summer club, and there are four leaders who help you with singing. 12 copies needed - you need three licences to cover this.